Apple to Go Back to User-Replaceable Batteries? "I just fell in love with a laptop, and for the first time since the IBM Thinkpad T40, it isn't a Mac. "The ASUS Eee PC 1000HE 10-Inch Netbook is exactly what I want in a Netbook and here's why . . . and what Apple could do with this hardware. "Today's NetBooks are a bit too slow. The 1.6GHz Intel Atom N270, which is in just about every NetBook out there, can't do video very well and lags often enough when typing or opening programs to get annoying. The update in the Intel Atom N280 is just enough (especially with the faster 667MHz front side bus. memory and GN40 chipset) to get the job done. Coupled with the new processor, the 1000HE also has a much denser battery pack which ASUS says can ride 9.5 hours (real world is closer to 8 hours). Wow, perfect. "While I would happily shell out a few extra bucks for two or more GB of RAM, the Hard Drive really hits the sweet spot. My $1500 Unibody MacBook has the same 160GB that this $370 Netbook has. Hrmph. "The comparisons to the MacBook don't stop there...."
"Three Apple patent applications have surfaced indicating the company may be rethinking its policy of using non-user-serviceable batteries in its mobile devices. "One of the applications describes a 'host machine' - looking much like an iMac in the accompanying drawings - that has battery-charging slots built into its body. "A second describes how the host machine could communicate wirelessly with mobile devices to monitor their battery power, notify users when it was time for a charge, and talk with other host machines about the state of the batteries it's servicing. "A patent application uncovered by The Register seem to indicate that Apple is interested in making batteries user-replaceable." "My guess is that Apple may be coming up with a backup plan in case their current approach to batteries starts drawing legal attentions, in particular from the EU. There are some people who see non-user-replaceable batteries as a crime against the planet...."
Link: Apple to Go Back to User-Replaceable Batteries? "As you probably know, the white version comes with 2 GB of 667 MHz DDR2 RAM. The Aluminum version comes with 2 GB of 1066 MHz DDR3 RAM. Both have a 1066 MHz front side or front system bus... all I know is it has the abbreviation FSB. My question, which I've posed to crucial.com, but they didn't know, and Apple, ditto (amazingly...), was whether I could take out the 2 GB of RAM in the whitebook and upgrade it to, not only to 4 GB, but also in speed. "A quick search of the web brings up these shocking statistics: A laptop is stolen every 53 seconds, more than 12,000 laptops disappear each week from US airports alone and only 3% of laptops are ever returned (http://www.propeller.com/story/2008/11/24/interesting-laptop-theft-statistics/). Before you become a member of that sad statistical group, consider employing some anti-theft deterrent. Physically locking down your laptop is one way to keep your laptop from disappearing, but sometimes you can't or don't have an opportunity to lock it down. This is where laptop-tracking software comes into play. "LoJack best known for their Stolen Vehicle Recovery System have lent their name to Absolute Software's tracking software. The LoJack for Laptops is a program and computer retrieval service that helps track, locate and recover stolen computers. The software works behind the scenes to silently and securely protect your Mac. If stolen, the machine can be remotely activated to contact the LoJack monitoring center every fifteen minutes. The Absolute Recovery Team will then track the location of the laptop and engage local law enforcement to recover and return your precious Mac...."
"I love to browse, read, and type my way through my morning as I sip my 100% Kona Joe coffee. But containers of liquid near a computer is, as my husband, Rob-ART, says, '...an accident waiting to HAPPEN!' I keep my Mac Pro to my left on a desktop and my MacBook Pro on my right. My tall coffee cup was poised between the two and every time Rob-ART walked past my desk he would hummmmm the tune to 'You'll Be SORRY....' I was confident that my neat and careful ways would triumph, but one day the unthinkable HAPPENED! "I enjoy my coffee sipping morning routine, but I didn't want to repeat the accident, so a search ensued for the ultimate, leak-proof drink container. This is what I found . . . the Contigo West Loop Mug. "Contigo guarantees that the contents of their mugs are impossible to spill and 100% leak-proof...."
The 16 oz. Contingo West Loop Mug is currently available from Amazon.com for $19.19 in silver. A 2-pack with maroon or rose and stainless sells for $35. Contingo also makes leak-proof travel mugs and kids mugs. "Many of you emailed us expressing a wish that there was a 500GB 7200rpm 9.5 mm thick notebook drive option for the 'unibody' MacBook Pro. Your wish has come true. Introducing the Seagate Momentus 7200.4. "We benchmarked it using QuickBench and Disktester against the 320GB 7200rpm drive that shipped with our MacBook Pro 2.8GHz test unit along with some other notable notebook drives." "The Seagate Momentus 7200.4 gives the high-end laptop user both speed and space. It's not only the fastest notebook HDD we have ever tested but provides as much storage space (500g) as any other drive available. It's super quiet and even when we were beating on it, it never rose above 91 degrees F."
Speedmark 5 scores for 2 GHz MacBook White and other Mac notebooks. "What do these changes mean in terms of speed improvement?" "Of course, the best solution would be for Apple to - as it did for nearly the last 20 years of Mac laptops - offer a true matte-screen (as an option, in this case) for those users who simply cannot put up with glossy displays." "For now, most consumers are sticking with the cheaper alternative. Who could blame them, given the battered economy? "A new report from the PriceGrabber.com comparison shopping service indicates that of those online users who are familiar with SSD technology, only 11% said they'd consider buying a netbook with the technology in the next few years. Another 43% indicated a willingness to do so only if the price dropped...."
"Intel has already begun shipping the latest update to its beloved Atom processor. The Atom N280, rated at 1.66GHz, will be a smidge faster (.06 GHz to be exact) than the previous N270. "More than just a bump in megahertz is the slight shift in architecture, as the new platform integrates north bridge functions such as the memory controller and graphics core into the processor die. This will allow DDR2 memory to scale from 533MHz to 667MHz and optimize video playback." "Intel has confirmed it is already shipping the next incarnation of the Atom processor. "The chip maker's successor to the near-ubiquitous netbook chip, the N270, is landing in the hands of laptop makers well before the anticipated mid-2009 release. Those presently mulling a netbook purchase may want to hold off for a bit...."
"The One Laptop Per Child Foundation of Cambridge was established to bring the world's children a $100 laptop, and according to founder Nicholas Negroponte, the organization is still determined to reach that goal. But last year, it quietly raised the price of its proprietary XO laptop from $188 to $204, more than twice what the foundation originally hoped to charge. Now Negroponte is promising to cut the price of the XO by $24, to $180. 'I believe it will go down another $20 soon,' he added. 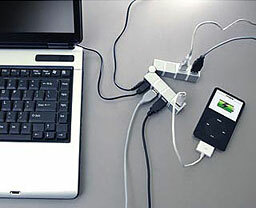 But even at $160, the laptop will cost far more than its original $100 target price...."
PR: An especially attractive solution for owners of Apple's port challenged laptops, this compact 7-port USB hub from X-TremeGeek.com folds in the middle for travel and features 4 roatating ports for maximum versatility when connecting several USB devices at once. An included AC adapter provides additional power to the ports. 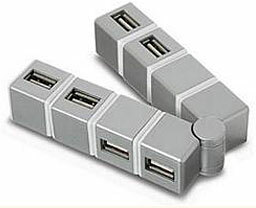 We've never seen anything like this at Low End Mac - very clever! "If you haven't seen one yet, let me just tell you that this is the must have service for artists. With 512 levels of sensitivity, and a screen surface designed to feel like paper, this touch-screen out-performs any other tablet on the market - not to mention the fact that it's a Mac! The best part is, that you don't have to buy a whole new system ($2249 for a complete Modbook), just upgrade the MacBook that you already use, for half that price ($1149), and it comes back with all of your data and programs intact - sweet. "We have posted a new, stop-motion take apart HD video of our Overnight ModService. Watch the conversion of a standard MacBook into the only Tablet Mac in under two minutes."